I could swing a few cats in here! My cardigan on the chair! Check out all those windows! And, yes, that is my unmade bed, where I am perched writing and my stuff on the desk. Last night we were making gyozas from this recipe and I didn’t take a single photo but I can tell you they were delicious. But yesterday morning, I was baking muffins and, since it’s Muffin Monday, I will share. 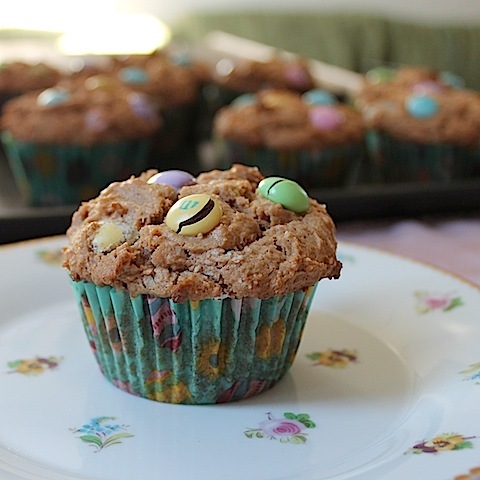 Our ingredient this week is peanut butter and since nothing goes better with peanut butter than more nuts and chocolate, I added in Nutella and Easter M&Ms. My younger daughter and one of her roommates enjoyed a couple and then we took a few up to my elder daughter who works on Sundays at RISD|Works for her to share with her colleagues. They were a hit! Preheat your oven to 350°F or 180°C and prepare your muffin pan using non-stick spray, butter or by lining it with paper muffin cups. Put your flour, sugar, baking powder and salt into a large mixing bowl and give it a good stir to combine. In another smaller bowl, whisk together the peanut butter, Nutella, milk, vanilla, egg and canola oil. Pour that luscious, chocolately peanutty mixture into your dry ingredients and mix until it is just coming together. You’ll still see a little flour, but that’s perfect. See that? That's how you know this muffin will be delicious. Divide the batter between your muffin cups and poke a few more M&Ms into the batter for decoration. Bake in your preheated oven for about 20 minutes or until a toothpick comes out clean. Cool in the pan for a few minutes and then remove to finish cooling. I didn’t have a wire rack here so I put them on another baking tray that was chilled from the cold weather we are experiencing. And several were eaten warm, almost straight from the oven. Yum! If I could legally marry these muffins, my boyfriend would have some serious competition. Well - I have so much to say I don't know where to start! First, just when ya think you know someone they tell you something like...........they are a LONGHORN! Holy cow! One never knows *shaking head*. I would say the reason you lived in a hovel in college is because you went to college in Texas! :) xoxoxo. I am shocked at the luxurious accommodations of student housing in Rhode Island though! M&M cupcakes? I can't believe it - I've never seen or thought of them before but I have a bag of dark chocolate M&Ms just waiting on me to make them into muffins now! I pinned them onto a couple of boards so I don't forget! About the Longhorn thing, truth is, I hate to brag so I don't mention it much. It can make folks from Oklahoma jealous sometimes. :) In defense of my old dorm, Kelli, I have to say that Contessa West was off campus and considered quite nice (and expensive) compared to the on campus dorms. The rooms were just small. The campus apartments here are large by comparison, but are certainly are not fancy. This particular one is older and has what we like to call character. The dark chocolate M&Ms are my favorites! I've never baked them into muffins since they get eaten too quickly but I am sure they would be wonderful. Since I have lived overseas since the year after I graduated, which was back in the dark, dark days before internet, I haven't followed college football at all so I am not emotionally invested in all of that like some people who "bleed orange" are. I would probably think your pillow is cute. I'm flexible like that. :) I think you can attach a photo to these comments. 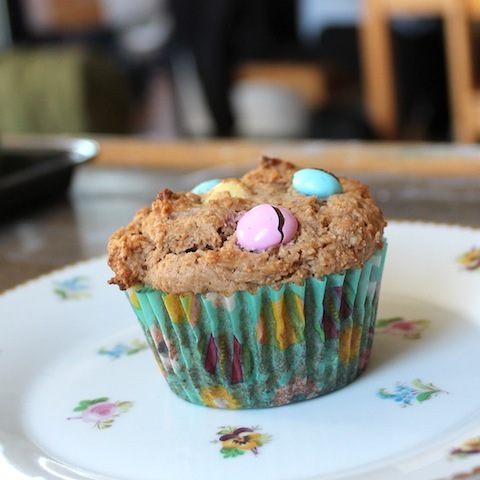 Super yummy muffins. I love sweet muffins. These would be gobbled up in no time here. Love her place. It's really cute and very spacious. Love that she put her own stamp on it, I love when you look at a place and you get the owner's vibe by how it's decorated. Thanks, Kim. She was reading my blog after I posted and said, "You put a picture of my BEDROOM!" Apparently the living/kitchen area was fine. I said, "Yes, but I said the mess was mine!" She was still not impressed that I shared. So thank you for your supportive words for her decorating. I'll pass them on! You can't go wrong with peanut butter and M&Ms, Kim. You just can't! That was my freshman year too, Lynn! The food was great! I adored the fried cauliflower especially. All these years later, I still don't know how they did it. There seemed to be some cheese between the cauliflower and the crunchy outside.